This post was written by Toni Anderson, a student in my Create A Profitable Online Store Course. Now if her name sounds familiar, it’s because Toni was a guest on my podcast 1 year ago in episode 39 where we talked about how she runs a 6 figure blog, consults on the side, runs a conference and home schools 7 kids all at the same time. Now a lot has changed in the last year. For one thing, she decided to stop consulting and then reached out to me wanting to open an online store to replace her lost income from consulting. 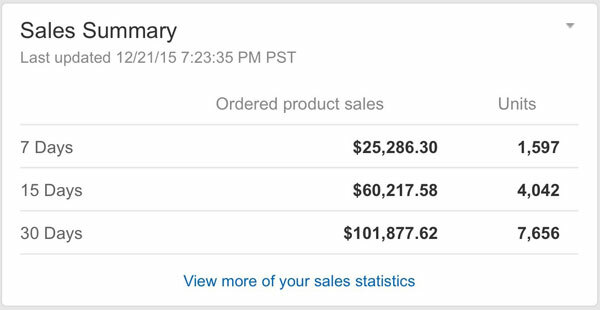 So she signed up for my Create A Profitable Online Store Course and her results have been staggering. In just 7 months, she’s made over $190,000. And during the holiday season, she made $100,000 in just a single month. Now I’ve had students make 6 figures within 6 months before but this is the first time that any student has done 100K in a single month in such a short period of time. Plus, she did not leverage her existing audience for sales either. In this post, Toni tells the story about her foray into ecommerce. Enjoy! I’d been working on the internet for almost ten years when I met Steve in the summer of 2014. However, I knew little about the world of ecommerce and was intrigued by his business. We kept in touch and after several months I decided to quit my consulting job and go back to working for myself. Ecommerce seemed like the perfect new venture for me. I had years of experience with online marketing, promoting products, Pinterest ads, and even building websites. I had run numerous social campaigns and had a network of almost two thousand bloggers I could tap to help promote or review my products. Editor’s Note: What’s really impressive about Toni’s story is that she never ended up leveraging her network at all. I loved the idea of developing my own brand and felt I was already in position to have a very successful online store. I started slowly going through Steve’s course in early 2015 and was hoping to launch a product by late summer, although I had no idea what that product would be. In April of 2015, a friend called me and told me she was coming over right away. She knew I had been learning about ecommerce and had an idea. She came over wearing a sample product that she had made herself from items purchased off of Etsy. She had listened to a few podcasts and thought there was an opportunity to sell on a much larger scale. It took about fifteen seconds for me to realize she had stumbled on a great idea and by the end of the afternoon we had set up our LLC, purchased a domain, opened an Amazon account, and were talking about how we could order our products in bulk from Alibaba. Our initial strategy was to order 200 products from a supplier in California and list it on a daily deal site at a reduced price. This would help us achieve two goals. The first goal would be to raise a bit of capital to invest in more product, the second would be to market to the people who purchased on the daily deal site and hopefully get them to purchase additional items on our own website. We had issues initially getting our order from our California supplier, so our daily deal was pushed back until late June. Growing impatient and feeling like we needed to launch quickly, we each decided to invest $1500 into the business and put in a bulk order from overseas so we could start selling in early June. Our plan was to launch on Amazon, get reviews, earn some money, reinvest in more products (different styles), launch the website, then spend money on ads to drive people to the website. I casually mentioned that if we were selling thirty items a day by Christmas we could consider our first year a success. Our first two listings went live on Amazon, May 28, 2015. We’d ordered 1,000 units and figured it would last us a few months and help us feel out the market. We shared our Amazon launch with family and friends and posted about it on our branded Facebook page which we had grown to about 1500 fans. We sold several items a day for the first few weeks and we gave away about ten products in order to get reviews. Because there wasn’t much competition on Amazon, we got to page one for several key search terms in the first month for one of our products. Sales doubled and we realized we needed to place another order so we didn’t run out of stock. At this point we had only been working with one vendor because we wanted to launch quickly and they were able to get things manufactured and delivered the fastest. In sixty days our initial stock was almost sold out. We had another order arrive, but the manufacturer shipped us the wrong item! They offered to correct it, but we were about ten days away from going out of stock on Amazon and we didn’t want to lose our page one ranking. We ended up taking apart our products and remaking them with parts purchased in the US so we could get another shipment to Amazon before we ran out. Little did we know that this would be a sign of what we could expect for the rest of 2015. Our sales on Amazon continued to increase and with each new product we managed to get rank fairly high in search quickly. We were able to drive traffic to our products via Pinterest and a very small Facebook campaign. We were hesitant to place big orders of new products because we felt this all might be too good to be true and we might be stuck with thousands of products that we would have to liquidate on eBay. Unfortunately, this hesitancy meant we were constantly battling inventory issues. We ran out of stock multiple times in the fall of 2015 which significantly hurt our sales since going out of stock on Amazon means your product disappears from the search. We were also unable to officially launch the website because we never had enough stock to be fully operational. My partner and I joked that we could write a book on inventory mismanagement due to our constant going out of stock. Not wanting to experience the dreaded Amazon disappearance over the holidays, in September we sat down to calculate how much inventory we would need to stay in stock for the rest of 2015. I asked a few ecommerce experts how to determine holiday sales and they all said to expect 4x my current sales. At the same time we were calculating our Q4 order, I stood in front of one hundred of my peers at a conference and stated that my big, crazy goal for 2015 was to do 100k in revenue during a thirty day period. I’m not sure anyone believed I could do it (not even me) but I knew that if I didn’t set a goal I wasn’t going to hit anything. We were making over 10k a month in revenue (and growing), and I felt like we had the right product to really capitalize during the holidays. The only way we could hit that goal is if we had enough inventory to sell, so we put in a huge order that was well over the 4x estimate. We were excited and ready for the holiday sales to come pouring in. I was also beginning to plan out some strategies for our website. Our goal has always been to grow the website so we aren’t dependent on Amazon, and we finally had enough inventory to start implementing some social media promotions that were my bread and butter in consulting for so many years. Then, one morning in early October I logged on to Amazon and was shocked to see my listing, my images, and my description, but with a much lower price. I thought our Amazon account had been hacked! In reality, one of products (which was growing in popularity) had been piggy backed and we had lost the buy box. Up until this point, we had been so busy trying to stay in stock I had stopped my ecommerce education, but I quickly learned as much as I could about piggy backers and how to stop them. You can read more about that here —> I can only assume you have a post Steve. Editor’s Note: Why yes I do. Click here for the post. While I started to take measures to get rid of the piggies (as we called them) I was told by Lars Hundley to lower my price in order to regain the buy box. If the piggies had the buy box they would see our volume and grow more determined to undercut us with a counterfeit product. Editor’s Note: Lars Hundley is going to be a speaker at the Sellers Summit. Lowering the price increased our sales of the piggy backed product dramatically. Sales increased by ten, then twenty and in a month our sales had increased by fifty percent. The increased sales also meant we once again ran out of stock. We were only out of stock for about 18 hours, but in that time the piggies saw enough of our volume to drop their price even more, which forced us to drop our price again too. Sales went crazy. Before we were piggy backed we were selling fifteen units a day. Thirty days later we were selling fifty a day and sixty days later we were selling almost one hundred and fifty units a day. So much for the 5x we had planned on for Q4. At this point we were at 10x and begging our supplier overseas to overnight shipments so we could stay in stock on Amazon. On Thanksgiving weekend we went out of stock again. At this point we were selling almost 200 units a day and there was no way I was going to let the piggies know how much money they could make by undercutting us even more. I had inventory at my house, but knew it wouldn’t get to Amazon in time, so we switched to merchant fulfilled for our most popular product. Editor’s Note: Merchant fulfilled is when the shop owner does all of the shipping for orders placed on Amazon. Sunday morning I woke up to almost 100 orders in Seller Central. By the time I got home that afternoon there were another 50 orders waiting to be fulfilled. 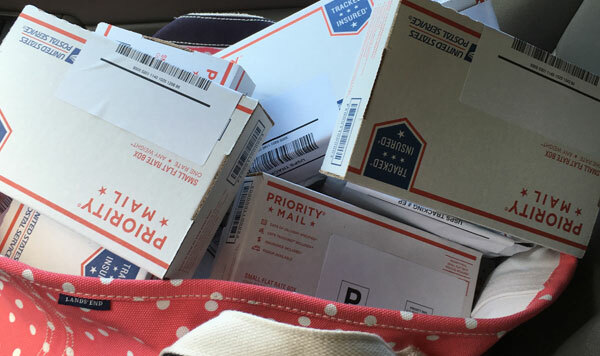 I knew all these orders had to go out Monday morning, but we weren’t set up to ship more than a few orders at a time. The next four days were a blur as I tried to figure out merchant fulfilled on the fly. I bought printers, ink, paper, labels, envelopes and made several trips to the post office and office supply store each day. We were not only putting together the product, we were also packaging and shipping. We started piecing together pieces of broken products to stay in stock. We ran out of our custom packaging, warranty cards, and product accessories. In four days I shipped out almost 600 orders before we went back in stock on Amazon. I vowed that I would not be doing this again next year. The good news, even with the price drops we were still profitable. Thankfully our product has good margins, so we were able to withstand the piggy backing price war and still make some money. It took us almost two months to get rid of the piggy backer and I’m sure we’ll be dealing with them again in 2016. I survived four days of merchant fulfilled hell, sold a ton of products, and made it my personal goal to stay in stock in 2016. Throughout the month of December our sales continued to increase. It wasn’t uncommon to do $4,000 in sales in one day. The goal of hitting 100k in 30 days was becoming a reality. We ended up having more issues with our supplier and had to switch back to merchant fulfilled for a few days in mid December in order to stay in stock and meet our sales goals. At that point we were so close to 100k, it was worth it. On December 20th, we hit 100k for 30 days. It felt great to reach the crazy goal I set in September and reach this milestone just seven months after our first sale. I also believe that growing so quickly forced us to learn the world of ecommerce much quicker than normal and we made a lot of mistakes in the process. We had to liquidate one item because it wasn’t what we ordered. Liquidating bad inventory is much better than going out of stock, especially on Amazon. We used many of the principles taught in Steve’s course to get to page one on Amazon. When we went out of stock we lost our position in the search and we still haven’t regained it on several products. We were hesitant to place large orders initially and were always playing catch up with inventory, which hurt our sales for the past four months. We had numerous issues with unsatisfactory items being shipped to us. Many times it was the only shipment we were expecting and needed those items in order to stay in stock. We have dealt with significant quality issues, major production delays, and haven’t had another reliable supplier to use when we’ve had issues. Had we known the importance of having multiple suppliers, we would have made that our focus early on in the business when sales were slower and we had more time to work on administrative projects. When we launched there was very little competition. We knew the competition would come so we created a brand, and included branded items with our product. This helped us when it came time to stopping the piggy backers and also gave customers a better experience when they purchased from us. The customer is always right, even when the customer is totally wrong. It is hard to respond nicely to complaints when people are “yelling” and calling you names. However, we’ve received numerous product reviews mentioning our great customer service and willingness to make things right. We know people buy from us again and purchase multiple products. Creating a great brand and doing the right thing keeps your customers returning. In October I invested about $1500 and attended two ecommerce events. It was difficult to spend that kind of money when the business wasn’t making millions of dollars, but I’m positive that what I learned at these events helped us reach our goal of six figures in thirty days. When things got crazy over Christmas, I had my new conference friends I could instantly message, text, or call for advice. The people I met at the event provided invaluable help and were one of the main reasons we reached our sales goals. I made back my $1500 in one day, thanks the people I met and things I learned at the conference. Editor’s Note: If you want to experience an intense ecommerce learning experience and network with other like minded entrepreneurs, join us at the 2016 Sellers Summit in May. In 2016 we need to solve our inventory issues and build relationships with several vendors so we have a steady supply of quality products available to sell. Once that is resolved we’ll be working on growing our website and email list through our social networks and advertising. We hope working on those two problems will help us reach the goal of tripling our sales in 2016. Editor’s Note: If you are interested in starting your own profitable ecommerce business, then click here to sign up for my ecommerce course. photo credit: cruzandos el hielo Blastoff!! Thanks for sharing this story Toni…and Steve. I would be curious though to know what kind of profit margins you had on all the revenue you created. At the end of the days those are the numbers I think most would like to know about and I just wonder if this pricing war you had to wage w/ the “piggy-backers” meant very slim profits at the end of the day? Our margins are about 60% when we can sell at full price. During the worst of the piggy backer phase we were at about 30%. The profits definitely took a hit, but the volume helped make up for it. Obviously, I’d like to sell high volume with a high margin and that’s what we are working towards this year. Those are great…even at 30%! Congrats on your success. Contrats Toni! I’m so happy for you. I too have felt the repercussions of going out of stock on Amazon, sometimes because they lost an entire shipment of inventory that was needed to prevent it. You just slide down to the bottom of the mountain and have to climb back up all over again. I used to let my inventory go low before reordering in order to control cash flow, but lesson learned on that, no more stockouts allowed! Yes! We had several shipments lost during December, only to be found at the end of the month. So frustrating. We were trying to control cash flow as well, but lesson learned. Next year things will look very different. You were selling. Do u have a link to your site ? I couldn’t agree more. What were you selling? 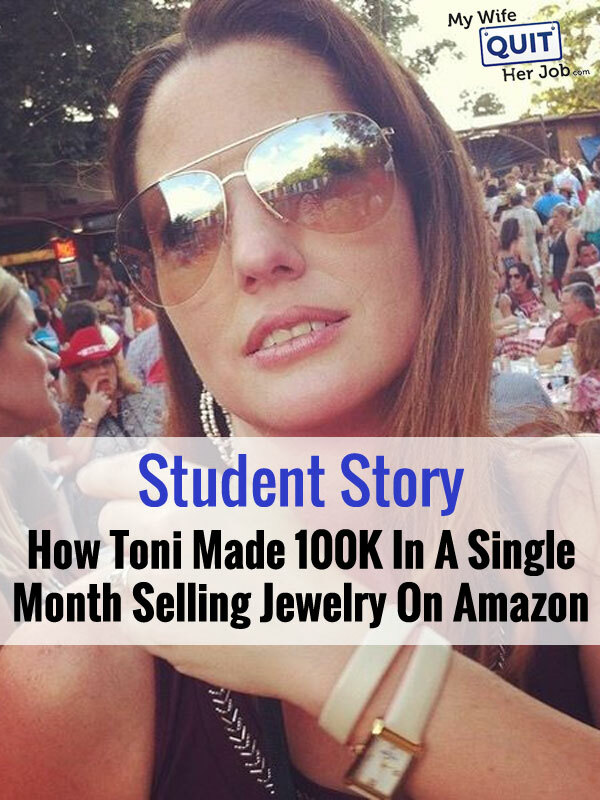 Unfortunately, Toni can not reveal what she is selling mainly because Amazon is really cutthroat. Unlike an online store, the barriers to entry for someone to come and hijack a listing or a product is much lower. So it’s generally in your best interests to keep quiet about what you sell on the platform. That makes no sense. Everything sold on Amazon is easily searchable and thus fully public. She was clearly undercut even when keeping it a secret, so it is silly to suggest that telling us would be a problem. We’re just trying to understand what she does because, frankly, the generalities make this sound like a fantasy rather than a reality. People can’t make informed decisions without all of the information. I would not tell. We lucky to get this much info. I have noticed many times when someone makes a YouTube video about how to start an online business and they specify a product they walk you through with just to show “how easy” it is, then the market gets flooded quickly with that specific product. I would like to see her page too but I completely get keeping it hush-hush. This is awesome, Toni! You were right — what a fantastic idea to run with! Thanks for sharing your story Tony! Can you share what your amazon store is or what jewelry you sell? If there wasn’t much competition on Amazon initially, how did you validate that it would sell well? On other sites like etsy or google keyword searches? We ordered 200 units initially and decided we would list on Amazon to test. Since our product isn’t that expensive we thought a small investment in product was worth testing directly on Amazon. If they didn’t sell well we could have liquidated them on a daily deal site and still broken even. Woww!! That is some highhdose of motivation.. Congratulations toni. Steve has taught initially order samples then go for 10-15 orders and then scale to 50-60 and so on.. But looking your case it looks like such small orders will not be helpful as i will be mostly out of stock and can not gain first page with small orders.. What would be your suggestions regarding first order size for someone starting out with amazon..?? Hi Mahi. It depends on the person. A lot of people come to me on a very limited budget so gradually scaling makes sense, especially if this is your first time selling a physical product. For my wife and I, we always buy in large quantities after the initial sample buy because we are a lot more risk tolerant. If you know you are going to have a hit, I’d start with as much inventory as you can buy. If you have a large budget, I’d buy thousands of units and give away hundreds for reviews during launch. When Toni got piggybacked, it actually helped her (mentally) because she was forced to lower her prices which resulted in insane sales. I am struggling to achieve 10K every month on Amazon, and you are doing this like piece of cake. Thanks for tips, I must try this on myself. Toni, It sounds like you found a dream product! Are you still making a lot of sales, even after Christmas? I agree, keeping the name of her company a secret makes me loose trust in all of it. It would only be good advertising for her and credibility for you as a teacher. Do you do any design work? I really like what you have done with your site. I have a shopify store for my skin care business that I am in the process of launching. Please let me know and if not, if you could offer any recommendations that would be amazing. This is really inspirational, especially as someone who just started homeschooling my youngest in March. I shut down my Etsy shop to focus on my kiddo, but am hoping to get it going again over the summer. My question is, are the skills taught in the course applicable to digital products? I’m a graphic designer, so I’m not dealing with physical products at the moment. Well done and well written. I took plenty of notes. I am curious though, how did you go about getting 1500 Facebook likes before your Amazon launch? I really want to know how to build an audience like that as well!